INTRODUCTION: The city state of Baron is aggressively expanding its territory... NO! Come back! This is different, I promise... By stealing the world's crystals (stick with it!) using their superior military might, particularly the feared Red Wings airship squadron. The captain of the Red Wings, dark knight Cecil, who is also the adopted son of the King of Banon, starts to question his father's orders after a brutal raid on the magicians' village of Mysidia, and is stripped of his rank and sent to investigate the summoners' village of Mist - accompanied by his best friend, the dragon knight Kain. On arrival, he discovers they have been tricked into destroying the village, and is determined to protect the last remaining summoner, a child named Rydia. What he discovers about his heritage will lead him on a personal quest for salvation, then forward to battle an other-worldly threat. MY FIRST PLAY: 2002, when the PlayStation remake hit these shores. 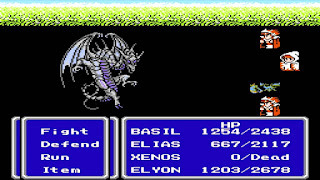 REAL WORLD: The fourth Final Fantasy game was originally planned for the Fmaicom, with Square deciding to develop NES (FF4) and SNES (FF5) games simultaneously. 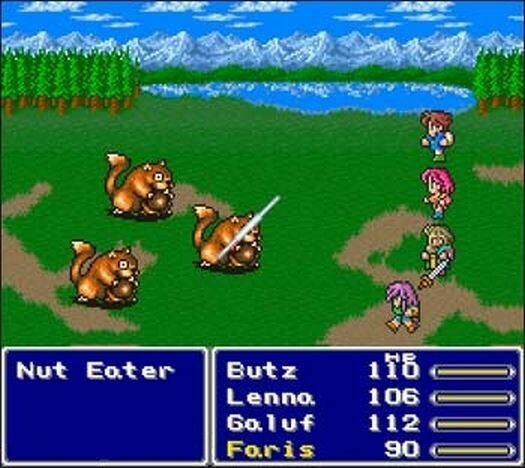 Whilst the NES version was cancelled, it was allegedly around 80% complete and some of the ideas therein were used for the now re-purposed FF5 on the SNES, which is this game... And was therefore retitled as FF4. Everyone straight? You won't be in a second. THE GAME: In what can be seen as a combination of FF2 and FF3, there are specific characters, but each of them has a specific job, meaning what your party can do is defined by who is in the party at that particular time, which in turn necessitates the use of a number of different strategies throughout the game. And what a cast of characters! Even compared to FF 2's partically-revolving roster, there's a ton of different characters, most of them mapped closely to one of FF3's jobs - so you have a dark knight, dragon knight, summoner, white mage, sage, bard, monk, another white mage (you'll need it), black mage and ninja, plus an engineer (just a fighter who uses a wrench rather than a sword, really) and... Well without giving too much away, a sort of baldy, beardy guy. So that's twelve characters - and whilst you essentially follow the arc of Cecil, Kain and Rydia (plus Cecil's love interest Rosa), each of them gets enough fleshing out to make them seem like a living, breathing character, with their own vendettas, romances, tragedies and obsessions driving them on through the story. Oh, and you can now have a maximum of five characters in the party as opposed to the series' standard four. This is also the first outing for the Active Time Battle (ATB) system - apparently inspired by Formula One, someone call Engine Blood! - which transforms a strictly turn-based game into something more dynamic. A bar next to your character's name gradually fills, and when it's full they can take an action. It's a small change, but it does introduce a new level of strategy, as you can time events to chain with each other, rather than just entering your actions at the start of the turn amd watching them play out in an only semi-predictable order. It was so well received that the series would not return to a purely turn-based system until Final Fantasy 10! 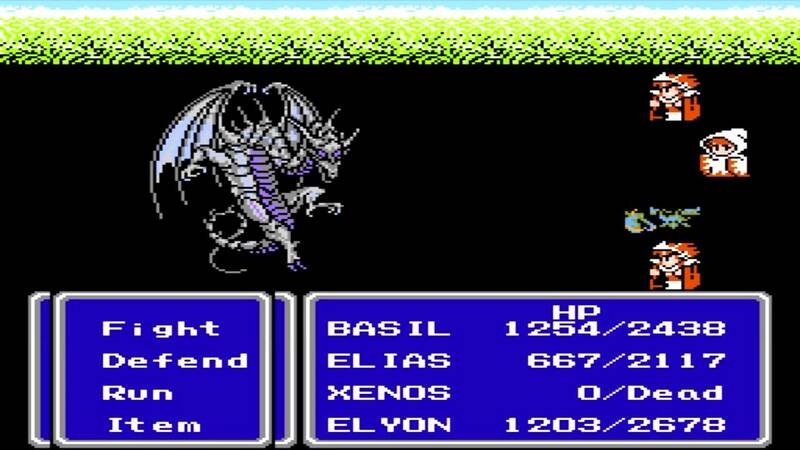 IT'S A KIND OF MAGIC: MP system, essentially the same as FF3. However, mages now learn spells by levelling up - aside from a few of the Summon spells, which are either gained by defeating the summon monster in battle or finding rare items. MEGABOSSES: Bahamut would seem to somewhat fit this bill, as an unnecessary fight against a very difficult enemy that nets you a great reward - the ability to summon Bahamut, the God of The Summons himself. There's a ton in the remakes though, including Proto-Babil on the 3DS, and Zeromus EG on GBA. REMAKES: Much like its predecessor, an eventual 3D remake graced the Nintendo DS, but us European proles didn't have to wait until then to play it - the 2002 PlayStation port, which is a pretty straight port, warts and all, was our first opportunity, and came bundled with FF5 as well. The definitive edition for me is the GameBoy Advance version released in 2005/06, which adds extra dungeons and the chance to use characters in the latter part of the game who had left your party permanently in previous versions. WORST BIT: That bloody magnetic cave where everyone has to use non-metallic equipment or be paralysed. I hated that bit. This is a superior entry in the canon, one that capitalises on the jump in technology to provide not just improvements in graphics, effects and sound, but an overhauled combat system, bigger gameworld and more absorbing story. FF4 still commands a great deal of affection amongst fans - and for very good reason. Join us next time for the next exciting instalment - quite literally, as we jump ahead to The After Years! INTRODUCTION: A group of four kids (Jesus, this again?) - or for the 3DS remake, one kid - has a nasty shock when they fall into a cave near their hometown, fight a giant turtle and find a massive, talking crystal that gives them the strength to go adventuring and asks them to restore balance to the world. For the crystals, you see, are dying (Jesus, this again?) - and with them the world. And these four children are destined to become the Warriors of Light (Jesus, this again? ), and save the world from excessive darkness. The story is actually a lot more complicated than that once it gets going - the synopsis really doesn't do it justice. So, erm... Let's get right to it! MY FIRST PLAY: 2004, NES emulator on my ancient PC (again). A walkthrough was kept close to hand as due to character limits, the English translation turned into absolute gibberish halfway through! REAL WORLD: Expanding on what they'd delivered previously was a real challenge for Square. The Super Famicom had been released, but they were still pushing the boundaries of what they could achieve on the Famicom; and so we get this. A game that is said to fill every last bit of the cartridge. It is the literal maximum the Famicom can cope with. And a game, perhaps predictably, that at the time absolutely could not be translated into English - and certainly not literally, as the character count would have burst the cartridge. 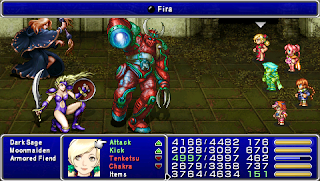 An adapted translation was also canned early due to lack of manpower, and its comparatively late re-release makes this one of the least-played FF games in the west. THE GAME: A partial return to FF1's simpler, EXP-based approach to levelling up, with the addition of Jobs. This means that rather than fixing a character's role at the start of the game, a character can change specialisations repeatedly. There are more different roles to choose as well; all six of the originals are back, with advanced versions thereof, and more specific variants like dragon and dark knights, vikings and scholars, and also summoners, making their debut - mage-type characters who summon huge godlike creatures into battle. Given that the game's engine deals more with what jobs your characters are rather than who they are, it makes sense that the four player characters are anonymous in the original game, a la the first game. They are described only as "Onion Kids", but the 3DS remake (somewhat pointlessly) gives them names and backstories: Luneth falls into the cave and fights the turtle, his best friend Arc joins to support him, Refia is the daughter of a local blacksmith and Ingus is a knight of Sasune, sworn to protect Princess Sara. And another landmark debut, you say? Kupo! Yes, it's the Moogles, strange anthropomorphic cat things with tiny bat wings and pompoms on their heads. Usually comic relief, no less than eleven of them were playable characters in FF6, and they have also technically appeared at Wrestlemania courtesy of The New Day. Oh, and there's also Fat Chocobo! Because body shaming gigantic birds is apparently a thing. Fat Chocobo is a MacGuffin to get around the party's limited inventory space. Extra items can be stored inside Fat Chocobo... Yes, he eats the items and regurgitates them at a later date. Don't blame me if your Elixir tastes of bird spit and stomach acid. Courtesy Square Enix, via YouTube. IT'S A KIND OF MAGIC: MP system, with around half the jobs in the game having some level of magical ability. Spells are usually bought, though some are found - and Mini and Toad are storyline elements, as they allow entry to certain locations. Ooh, difficult. There's no out-and-out space tech like Final Fantasy, but there is an ancient, technologically-advanced civilisation vaguely involved, and not for the first or last time. That puts it a whisker in front of FF2 in this respect. MEGABOSSES: There are none, to my knowledge, in the original. You could argue that technically any of the bosses guarding the equipment in the Forbidden Land of Eureka are megabosses as they are optional, but they're only on par with, or slightly less tough than, the bosses on the run-up to the final boss, so I don't count them. The 3DS remake whacked an Iron Giant in to fill this particular gap, so all is right with the world. REMAKES: Well it probably won't surprise you to know that there is a 3DS remake, since I've mentioned it about twelve times already. Released in 2006, it had a massive graphical revamp, with 3D, perhaps predictably, being the main upgrade. This was most Western players' first exposure to the game... Legally, at least. The list, unfortunately, goes on, and for a game offering so much choice in how it's played and what classes are used, any of these kinds of bottleneck really jar. I can see how it's trying to push players out of their comfort ones, but it does somewhat blunt the freedom with which it seems intended to be played. BEST BIT: The sheer epic scale, which is almost unthinkable for the NES. Between choice of jobs, number of locations (and trust me, when you think you've seen it all, you haven't - there's a point where your horizon expands near-infinitely), and the number of sub-stores that the player will find themselves involved in, you will be fully entertained all the way through - aside from the type of moments described above, of course. This is a fantastic technical achievement and a damn good game - though, and this might just be me being difficult, I did feel like the 3DS remake lacked the charm of the Famicom version, which stands as Square's magnum opus on the much-loved system.